"RetroLiner" is owned by Paul & Wendy Greenfield from Where ever we stop. Our caravan in it’s former life was a 1998 Windsor Sunchaser. Purchased the van in November 2009 from the Dodgy Brothers in Lismore NSW. Since that time the van has under gone major changes, mainly cosmetic and comfort. The van has been re-badged the RetroLiner, and although was a very boring off the shelf Windsor caravan, it came with absolutely no bells and whistles, and very reliant on that caravan park umbilical cord for operation. 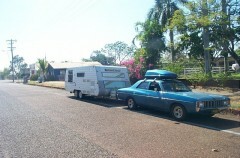 After becoming more aware of caravan travel, and the adventure to be had, and the absolute passion of hate of caravan parks after being lined up like sardines in an under sized tin, we commenced the long journey to have the Retro Liner transferred into an independent jobie, that now allows us to enjoy all the benefits of freedom camping. 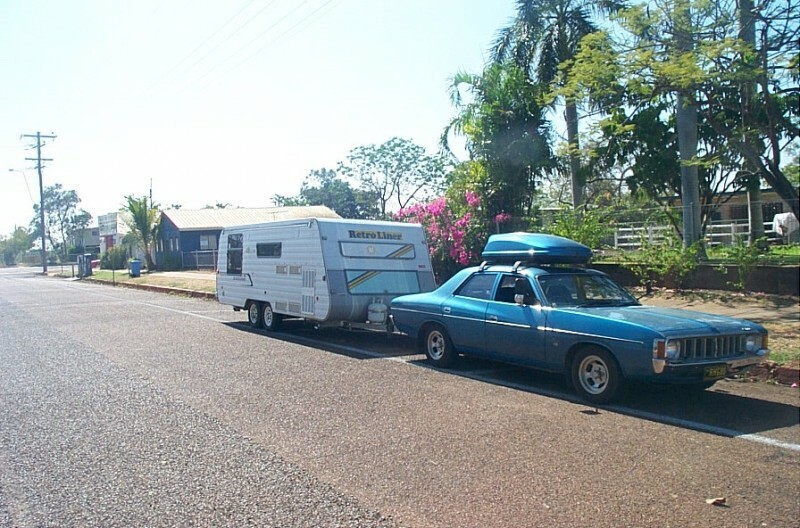 Our towing rig is a 1977 VK Chrysler Valiant, and been in our family since brand new. The vehicle has also been a project, and it now fully geared up to tow. Seems we get a lot of interest in our combined rigs. •	A domestic freezer that will requires 240 power. •	Hitching, un hitching, but that’s life. Our names are Paul & Wendy Greenfield, as known as the Retro Roamers. Although coming from trade backgrounds, (timber trades and hairdressing) for the last 25 years we have been in the tourist and accommodation industries. 2012 will see us basically retire from hospitality management, which is extremely restrictive for travelling. We may ge back to our hospitality roots, and become a couple of workers for a change. This will give us the ability to work where we want to work, not where we are required.